Let’s build a website about celebrated Chicago journalist Ethel Payne! You’ll need to have access to a command prompt (an application on your computer that allows you to execute text-based commands). Search for the Terminal application. All of the commands we’ll show you here will need to be typed into the command prompt. First you need to install and configure Tarbell. Make sure to set up a Google spreadsheet. Go ahead. We’ll wait. Now visit http://127.0.0.1:5000/ in a browser. You’re ready to start editing your template. It’s a good idea to organize your project’s files according to convention. That way everyone knows where to find things. Make directories named css, data, images and js in your project root directory (i.e., not in _blueprint) to keep your project uncluttered. See the section for creating and installing projects for more detail about best practices when creating your projects. Keys and values are a common idea in programming: each key is shorthand for a corresponding value. Each of the values in the values column is available to your site when you use the matching key in your template. Header fields that start with underscores, like _notes does here, will not be made available to your template. Look at your page in the browser again and notice the headline matches what’s in your Google spreadsheet under the value column with the key “headline”. Try changing that value in the spreadsheet to “Ethel Payne, Chicago journalist”. Reload the server at http://127.0.0.1:5000 in your web browser to see your changes! You can add as many keys and values as you like. We’ll add a few. Reload your site and look at the results! Tarbell uses Jinja2 for templating. Read the excellent documentation to learn more about using Jinja. Out of the box, Tarbell gives you Bootstrap 3 CSS. Chances are, you’ll want to extend this to add your own CSS to your project. Filenames prefaced with an underscore will be ignored when you publish your project. Our naming convention is to use underscores for “partial” templates that represent small pieces of the page, like navigation and footers. The first block includes Bootstrap 3’s CSS and your project’s default base.css stylesheet. Don’t worry about it right now. The second block is what you’ll want to extend. You’ll only need to touch the library_css block if you need to do something like override the version of Bootstrap included here. Otherwise, for adding project-wide styles, edit the base.css file. Your text should now be styled! While the Tarbell base.html template (see more on templates) contains some very handy things, you may find you need to override some of the provided templates. One of the most common cases in which this occurs is the navigation. Ida Tarbell would be proud of this website! Reload your test page. Bingo! Now, such a message probably isn’t very helpful to your users, so to create a more functional nav, copy the code out of _blueprint/nav.html, paste it into _nav.html, and rejigger the code as desired. It’s all Bootstrap 3, so you might find it helpful to view the Bootstrap navbar docs. With Tarbell, you can use a Google spreadsheet to provide any kind of data to your page: text, image URLs, and even latitude/longitude data that can power a map. We’re going to show you how to use Tarbell to store geodata for a map. Partials are always prefaced with an underscore _. This tells Tarbell to refrain from compiling them as independent pages. Otherwise, your project would end up with pages like yoursite.com/footer.html . Anything you write in a partial could also be written directly on a page, but using a partial makes it easier to reuse code. For instance, we may want to use our map on every page on our site, but using a partial means we only store the code in one file, making it easy to update and maintain. This tells Leaflet to create a map and set the center of it to Chicago, with a default zoom level of 6. 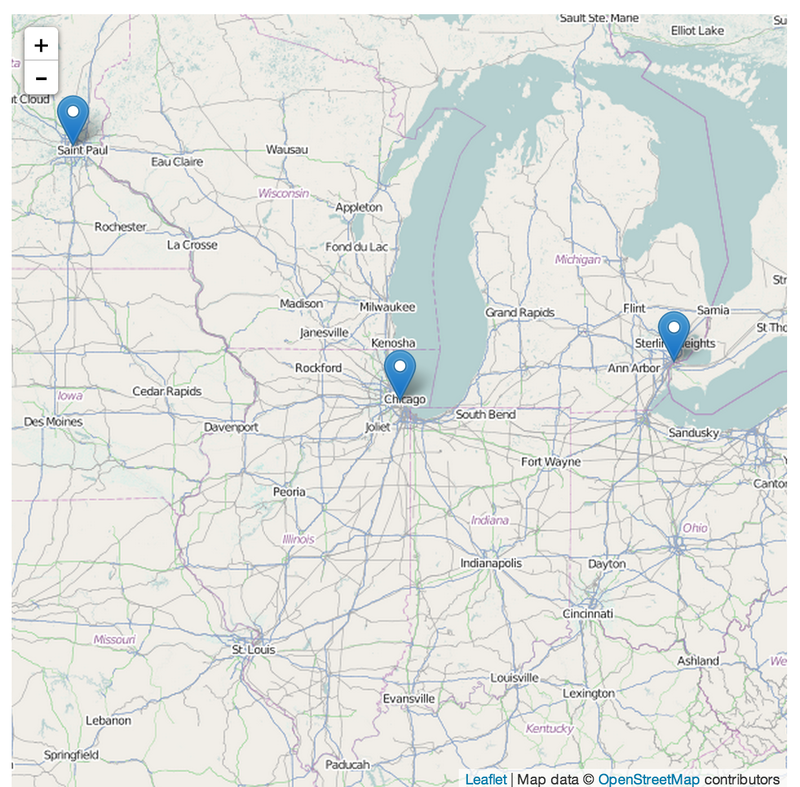 Leaflet map objects give you a great deal of control over your map’s appearance and behavior. The most basic settings are made via the setView method, which controls latitude, longitude and zoom levels. 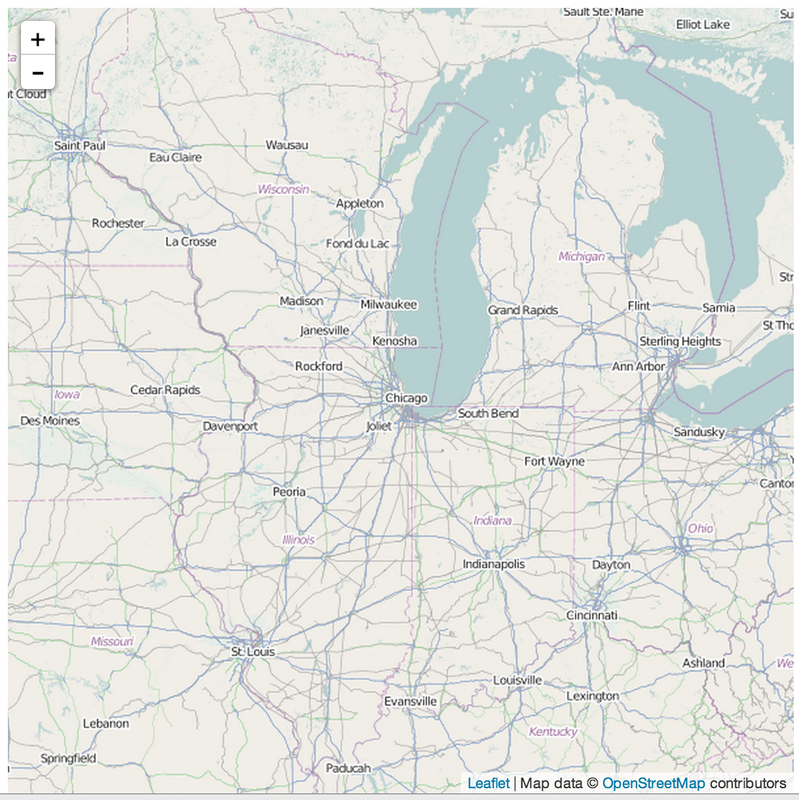 Leaflet exposes many methods and properties to manage the state of your map, though, and we definitely encourage you to check out their docs and continue experimenting at the end of this tutorial. Now, when you click on Chicago, the popup should show the name of the city. To delve deeper into what makes a Leaflet map tick, we recommend reading the Tribune Leaflet docs.